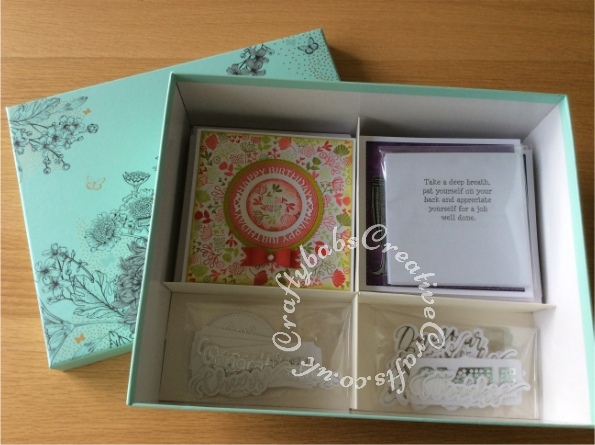 Presentation box of hand made cards with a selection of greetings and insert verses. Backgrounds made using Concord & 9th Lovely Blossoms Turnabout stamp with distress oxide inks, masculine ones inked and sprayed with mica sprays. I used a number of dies including; Crealies Nest-Lies Double Stitch Circles Nesting Die Set Crea-Nest-Lies XXL 33, Sue Wilson Perspectives Thank You & Happy Birthday Circle Die Sets, an unbranded small bow making die set and various sentiment dies from i Craft, Spellbinders, Cardmaking Magic, Tattered lace and Crafti Potential, embellishments cut with various brands of dies including Marianne, Sue Wilson, Fuzzy Lemon, Yvonne creations, Memory box, Sizzix and others.